We’ll Treat Your Entire Family! Because we want you to enjoy healthy teeth for a lifetime, we focus on preventing dental problems using patient education and regular professional hygiene appointments. Dr. John Verbeyst and Dr. Philippe Morisseau have many years of experience as general dentists, and they believe that preventive care is the basis for continued oral health. Keeping up with preventive care is the key to having a healthy mouth. 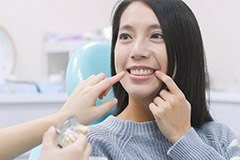 By maintaining routine dental appointments, you may avoid significant dental problems or at least become aware of issues in the early stages when they’re easy to address. We highly encourage that you schedule regular professional cleanings to keep your mouth healthy and strong. Call our North Kingstown office to schedule your general dentistry appointment here at Aesthetic Dentistry of Wickford. We serve patients from North Kingstown, Exeter, East Greenwich, South Kingstown, and all of the surrounding Rhode Island areas. Our dentists strongly recommend that patients plan to attend at least two checkups and cleanings every calendar year. By reviewing your oral health at regular intervals, we will be able to pinpoint potential concerns and damage as soon as it appears, making treatment simpler and more conservative. 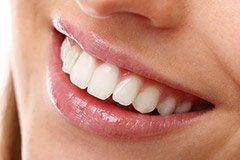 Additionally, a professional cleaning can rid the teeth and gums of decay-causing plaque, resulting in fewer cavities over time, and even eliminate any minor staining that’s occurred between visits. Periodontal disease (also known as gum disease) may start out as some mild oral bleeding and swollen tissue, but advanced cases can result in the loss of natural tooth and other severe consequences. 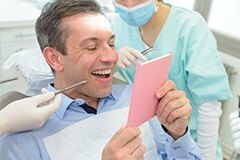 That is why the Aesthetic Dentistry of Wickford team will address it as soon as possible with effective therapy, such as scaling and root planing or ARESTIN antibiotics. 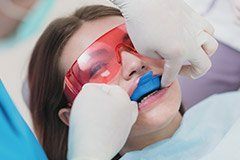 Dental sealants are a simple and effective preventive service that can help patients reduce their risk for tooth decay in vulnerable areas of the mouth, such as the chewing surfaces of the premolars and molars (back teeth). The sealant itself is applied painlessly and will fill in the pits and grooves, creating a much smoother surface that’s easier to clean and doesn’t attract the same high level of bacterial accumulation. While our dentists typically recommend dental sealants for children, adults who struggle with excessive tooth decay can benefit as well. When participating in sports that involve physical contact, it’s crucial to keep your body safe from harm in the places that matter most – and that includes the teeth. 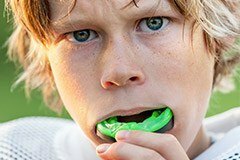 In addition to helmets and kneepads, our patients and their families should invest in high-quality sports mouthguards for optimal protection and confidence. Instead of grabbing a “one-size-fits-all” mouthpiece off the shelf at the athletics store, we can create a 100% customized appliance that fits comfortably, feels sturdy, and even allows for easy breathing and speaking when being used. Many professional adults are familiar with “bruxism” – it’s the technical term for chronic teeth grinding and/or clenching. This common condition can occur because of stress, anxiety, missing/crooked teeth, or a misaligned bite. What’s worse is that countless patients don’t even realize where their painful symptoms are coming from because they only grind when sleeping. Please let Dr. Verbeyst and Dr. Morisseau know if you are regularly experiencing jaw pain or if your tooth surfaces seem strangely worn-down. They can assess your condition and create a nightguard if needed to protect your teeth from unconscious harm. On average, oral cancer claims one life every hour of every day. 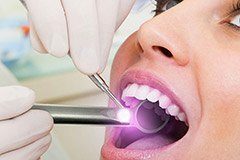 Many of these deaths could have been avoided if the cancer had been detected much earlier in its development – that’s why it’s crucial for patients and their families to visit a dental office that will perform oral cancer screenings as a part of regular checkups. Our dentists will carefully scan the oral tissue for suspicious abnormalities, such as slow-healing sores or discolored patches, and then share any findings with our patients so that they can take the next steps towards a concrete diagnosis. Fluoride’s positive effects on oral health are numerous and well-documented by research, which is why our dental team strongly recommends regular exposure for children in particular. The presence of fluoride in oral hygiene products and drinking water helps to not only strengthen developing teeth, but also aid in the remineralization process to prevent cavities. 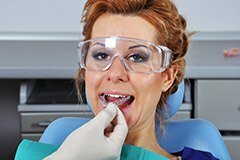 Professional fluoride treatments can also be provided as a part of regular cleanings here in North Kingstown; the process only takes a few minutes and is very comfortable. 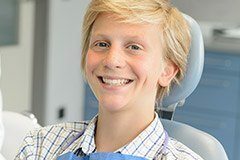 Being able to provide a comprehensive variety of services is important to our dental team, and several of our options are specifically kid-friendly so that your entire family always feels welcome here. Dr. Verbeyst and Dr. Morisseau spend plenty of time with children in order to help them feel genuinely calm and comfortable throughout their visits, providing personalized care that’s the right fit for their current age and level of emotional maturity. By instilling good habits early on, we can help your son or daughter enjoy a happy, healthy smile for life!